Former Gourds frontman Kevin Russell’s musical journey began in Beaumont,Texas at age 14, when he found a guitar, a sewing machine, a billy club and a box of comic books under his father’s bed. Luckily he chose the guitar. Following his family’s oil boom and bust migratory path, he landed in Shreveport, where he formed the Picket Line Coyotes, a Husker Du meets Elvis Costello hybrid that lived and died between the “Arklatexabamassippi” borders. Next came Austin, where The Gourds were born from those Coyote ashes. That storied band came to an end after 18 years of good times and hard travelin’. 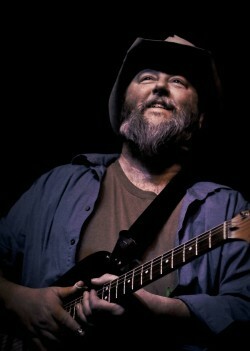 Whereupon Russell formed Shinyribs, perhaps best described as a greazy river of country-soul and swamp-funk and rent party, in which all styles of American music are likely to be touched on, squeezed, etc. Whether on his 6-string uke or his electric guitar or singing a cappella, Russell, a sort of Burl Ives meets Al Green figure, is an experience in and of itself. His original songs, laced with novel interpretations of popular songs old and new, make Shinyribs one of American coolest and oddest bands.